Why does black not move Queen here? in this board, after Nf5 as indicated, why does stockfish suggest the best move is king-knight e7? Surely it would be better to save the Q to h7 towards the check-mate on h2 (white knight blocks the white bishop, so Q safe here). Any ideas? Am I missing something obvious? Thanks. Qxe5 Rae1 (or Rfe1) pins the queen. Unpinning the queen with Nge7 (or Nce7) and an attack on the white queen does not help since after Rxe5 the knight on e7 is pinned and cannot capture the white queen. After Nf5 ...Qh7? ?, Nd6+ wins the queen. Not the answer you're looking for? Browse other questions tagged learning strategy stockfish or ask your own question. When and why should I move the pawns in front of a castled/non-castled King? Is there a concept of 'good' knight and 'bad' knight? What Strategic Plan White Player should have implemented in the Middle game? Why does Stockfish prefer White here? 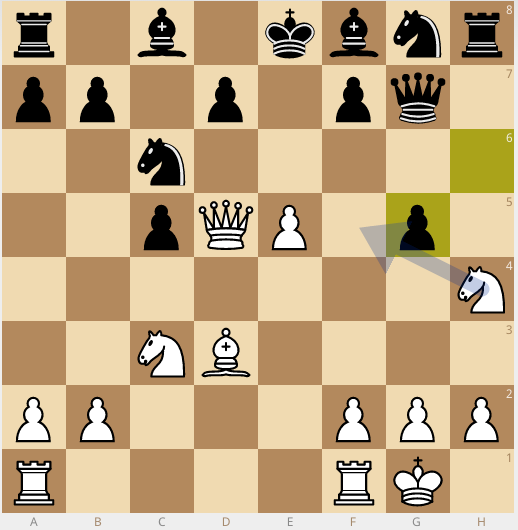 Why is Stockfish giving me this weird move? Do the King's side and Queen's side pieces have different values because of which square color they start on?